Description: CSXT 742 and UP 9671 lead a Q59708 north of the NS/CSX diamond. 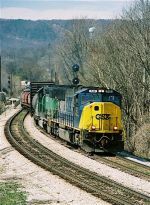 Description: A S/B mixed snakes it's way past the entrance to Wauhatchie yard. Title: Last Q train of the day is Q609. CSX 742 Leads CSXT 777. I manage to dig the 742 out of the dirt and get an artsy pic, but couldn't salvage the 777.